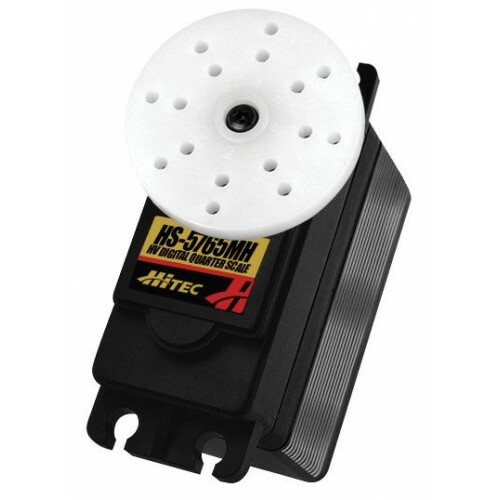 When it comes to your big RC projects, size does matter - that’s why Hitec engineered the HS-5765MH. This high voltage cousin of our popular HS-5755MG is 2-cell LiPo (7.4V) capable and features heavy duty, metal gears with a 10mm output shaft for the strength you need for the most demanding large scale applications. With 347 oz-in / 25 kg-cm torque, the giant HS-5765MH is tough enough to tackle your biggest RC projects from 1/5thon and off-road vehicles to large high-powered boats and giant scale aircraft!. Size in Inches: 2.32 x 1.14 x 2.04 in.